Paddleboards are tough enough to store and transport when you've got 1, let alone when you've got multiple SUPs to get to and from the water and store at home. New for 2016 is a product for anyone person or shop with a multi-SUP quiver: a 2 paddleboard cart, that quickly adjusts into a 2 SUP stand for indoor or outdoor use. And, if you just want the Cart or the Stand, you can get them separately, too. 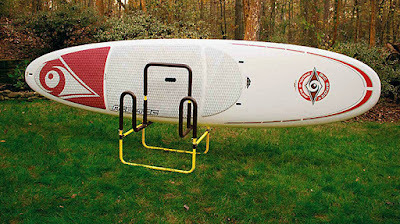 Double Paddleboard Cart: this Double SUP Cart makes getting your paddleboards to the water even easier. Load 2 SUPs up horizontally onto the cart's padded frame - don't risk the care of your paddleboards trying to overload other carts with 2 SUPs - they can't handle it. Load the center of your SUPs gravity over the cart, and face the boards outward if you need to accommodate long fins. From there, you can push your boards by their tails, or you can pull from the front; a SUP handle is an option for additional help managing your 2 paddleboards. 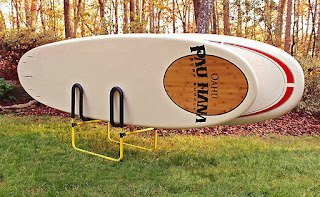 Double Paddleboard Stand: this Double SUP Stand makes storing your paddleboards easy. Load 2 boards up horizontally onto the rack's padded frame, and you'll have your SUPs ready to paddle whenever you need them, no setup or installation required. And it's fully portable, so you can move this freestanding rack wherever you're storing your SUPs next. 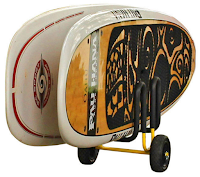 It's great for paddleboard enthusiasts or stores or shops using and storing their SUPs during the day, like SUP yoga studios, SUP rental shops, SUP schools, and paddle expos. Double Paddleboard Cart and Stand - if you need both the Cart and the Stand, you can get it in one product! 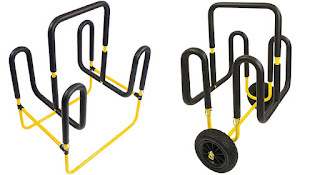 The combo set comes with an additional base frame that when you're finished using the Cart, remove the wheels (quick release) and snap the cart into the base frame and you have your Stand! The frame of the rack, whether it's the Cart, the Stand, or the Combo Cart-Stand, is made from heavy-duty T6 6063 Aluminum and the hardware is stainless steel, so the entire rack is rust proof - a must for any quality SUP rack. This means you can use the rack in your garage and move it in your backyard, or on your dock or deck when you want to move your SUPs. For retail use, you can display your paddleboards outside during the day and bring the racks and boards back inside at night.